Length from top of shoulder – Size A – 9½ ins. Size B – 10 ins. Length of sleeve seam – Size A, 6 ins. ; Size B, 7 ins. (or length desired). 8 stitches to the inch in width, measured over plain smooth fabric. Instructions are for smaller size A. Larger size B is shown thus [B- … ]. Using No. 12 Needles and L., cast on 32 [B-36] stitches. 1st row: * K1, P1, rep. from * to end of row. Rep. 1st row sixteen times. sts, inc. once in next st, work in rib to end of row (37 [B-41] sts). NOTE: Do not break off wools, carry up side of work. 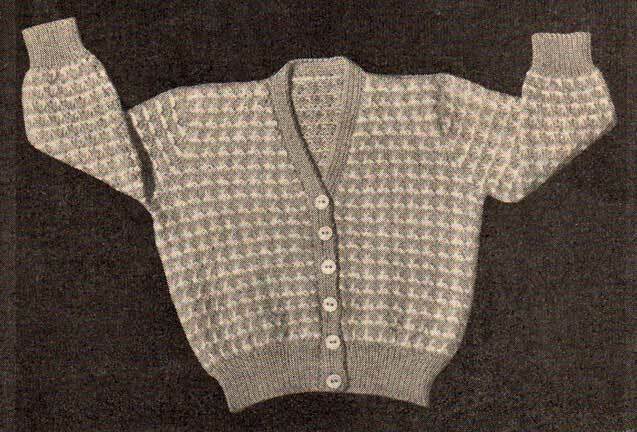 ** 1st row: Using L., knit. 2nd row: K1, P1, * K1, P3, rep. from * to last 3 sts, K1, P1, K1. 3rd row: Using D., K2, * slip 1 purlways, K3, rep. from * to last 3 sts, slip 1 purlways, K2. 4th row: K2, * wool front, slip 1 purlways, wool back, K3, rep. from * to last 3 sts, wool front, slip 1 purlways, wool back, K2. 5th row: Using L., K4, * slip 1 purlways, K3, rep. from * to last st, K1. 6th row: P4, * slip 1 purlways, P3, rep. from * to last st, K1. ** Rep. from ** to ** ten [B-ten] times. Cast off 3 [B-4] sts, work in patt to last 2 sts, K2tog. in every following 4th row three times (24 [B-27] sts). Continue in patt, dec. at front edge only in every following 4th row until 18 [B-20] sts remain. Work 4 [B-4] rows without shaping. 1st row: Work to last 9 [B-10] sts, turn. 2nd row: Work to end of row. Cast off. Work to correspond with Left Front, working shapings at opposite ends of needle. Using No. 12 Needles and L., cast on 70 [B-78] stitches. 1st row: K2, * P1, K1, rep. from * to end of row. 18th row: Work 2 [B-3] sts in rib, * inc. once in next st, work 10 [B-11] sts in rib, rep. from * to last 2 [B-3] sts, inc. once in next st, work 1 [B-2] sts in rib. (77 [B-85] sts). Work as given from ** to ** for Front eleven times. Continue in patt without shaping until armholes measure same at Front armholes. 1st and 2nd rows: Work to last 9 [B-10] sts, turn. 3rd and 4th rows: Work to last 18 [B-20] sts, turn. 5th row: Work to end of row. Cast off. Using No. 12 Needles and L., cast on 38 [B-42] stitches. Rep. 1st row fourteen times. 16th row: Work 4 [B-3] sts in rib, * inc. once in next st, work 4 [B-5] sts in rib, rep. from * to last 4 [B-3] sts, inc. once in next st, work 3 [B-2] sts in rib. (45 [B-49] sts). Work as given from ** to ** for Left Front once. Continue in patt, inc. once at each end of needle in next and every following 12th row until there are 53 [B-57] sts on needle. Continue without shaping until work measures 6 [B-7] ins. (or length desired) from commencement. Dec. once at each end of needle in next and every alt. row until 25 [B-27] sts remain. Work 1 row without shaping. Cast off. Work another Sleeve in same manner. Using No. 12 Needles and L., cast on 8 stitches. 3rd row: K2, P1, K1, yo, K2tog, P1, K1. Continue in rib, working a buttonhole in every following 12th row, until 6 buttonholes have been worked from commencement. Continue without further buttonholes until band is length required to fit along fronts and across back of neck. Using a flat seam, sew up side, shoulder and sleeve seams. Sew in sleeves, placing seams to side seams. Sew front band in position. Sew on buttons to correspond with buttonholes. Finally, press all seams. The original publication of this pattern is in the public domain, however this updated digital version is copyright Sarah Bradberry, July 25th 2012. All rights reserved.